Lord Chaitanya Mahaprabhu personally empowered Srila Rupa Goswami to reveal the innermost love and knowledge of his own heart to the world. Five thousand years ago Lord Sri Krishna spoke the knowledge of Bhagavad Gita to Arjuna on the battlefield of Kurukshetra. In a similar way, about five hundred years ago, Lord Chaitanya spoke the ultimate conclusions of all scriptures to Sri Rupa Goswami at Prayag. Srila Prabhupada has taught us that all the authorized followers of Lord Chaitanya are known as Rupa-anugas, the followers of Sri Rupa Goswami. Lord Chaitanya himself only personally wrote the eight verses of Shikashtakam. It was through the six Goswamis, headed by Rupa Goswami that he personally revealed the transcendental philosophy of devotional service. Rupa Goswami is in the spiritual world the intimate associate, maid-servant, of Sri Sri Radha and Krishna. His name is Sri Rupa Manjari. He has descended along with Radha and Krishna, who appeared as Lord Chaitanya, to help them in their divine mission. That mission was to dispel all misconception, the ignorance, and establish the true glory of pure devotional service of Vrindavana. All of the most purified, highly realized acharyas have worshiped Sri Rupa Goswami as their guru. His glories are unlimited. “Sri Sanatana Goswami, Sri Rupa Goswami and Anupam. These three brothers were simply glorious in every sense. From their very birth, they had pure devotional sentiments towards the Supreme Personality of Godhead.” – Radhanath Swami. Srila Jiva Goswami describes the genealogy table of Sri Rupa Goswami. In the twelfth century of the Shaka era there was a Brahman of the name Sarvagya Jagadguru. He was extremely learned in scriptures, very pure in his life, and was very, very powerful and attractive. In this way they made him a king in the province of Karnataka. And all the other kings would have the greatest respect and reverence for him. He had a son named Anirudha. It is said that Anirudha had the spirit of Indra and fame of Chandra. Like his father, he was very expert at the Yajur-Veda, and in other holy scriptures. He had two sons. The oldest was Rupeshwara. Rupeshwara was very gentle, very kind-hearted, very learned in the scriptures – a perfect Brahman. His younger brother was Harihara. He became very expert at fighting with weapons. He was a powerful Kshatriya in his spirit. The father, Anirudha, got both of his sons married. Soon after that, Anirudha died. Harihara, taking advantage of this situation, due to his powers, he usurped all the property and wealth of the entire kingdom, and left his elder brother, Rupeshwara, with nothing. Rupeshwara boarded a chariot with eight horses, and took his family from Karnataka province of South India to Orissa in Bengal. There, he settled down with his family. He had a son of the name Padmanabha. Padmanabha was also a very, very great, learned Brahman. And he was a very dear devotee of Lord Jagannath. Padmanabha performed a yajna. Due to his devotion and his prayers, he had eighteen daughters and five sons. One of his sons was named Mukundadev. Mukundadev also was a very great devotee of Jagannath, Krishna. And he had several sons, of whom the most illustrious was named Kumaradev. Kumaradev was married to a very chaste, pure-hearted lady named Revati. Such a great devotee and exalted person he was. Due to various family difficulties, Kumaradev went to the eastern side of Bengal, which is today called Bangladesh, and settled down in a village named Baklachandradvipa. He also built a house in a village called Fekyabad. Because there were so many devotees there, he wanted their association. Amongst Kumaradev’s children, three were most illustrious. Their names were Amar, Santosh and Srivallabha. They were later to be known as Sri Sanatana Goswami, Sri Rupa Goswami and Anupam. These three brothers were simply glorious in every sense. From their very birth, they had pure devotional sentiments towards the Supreme Personality of Godhead. As they grew up, they became exceptionally attractive to all of the society. They had beautiful bodily features. They were perfectly noble and self-controlled. Their minds were clear and clean. They had no envy toward anyone. They were simply embodiments of the Lord’s love. A devotee is para-dukha-duki. He cannot tolerate seeing the sufferings of others. Therefore Rupa, Sanatana and Anupam accepted what they considered the most abominable condition of life, just to protect the other devotees. They were so expert, these ministers of the Nawab Husain Shah, that he, the King, the Nawab accepted them as his own brothers. He even did something that was exceptional. The Nawab Husain Shah awarded two Hindus, that were devoutly following their religion, very exalted Muslim titles. He gave Sanatana the name Sakar Malik, Rupa Goswami the name Dabir Khas. The Nawab Husain Shah was a violent and cruel ruler. He was very, very passionate to usurp more and more property. So while he was out conquering other lands, he practically turned over the entire administration of his kingdom to Rupa and Sanatana. In fact, he even divided his own personal wealth with them. He bestowed upon them an immense treasury of money. In the city of Ramakeli he built them extraordinary, opulent palaces, one for each of the brothers. Of course, Rupa, Sanatana and Anupam were always immersed in the loving service of the Lord. On their property of Ramakeli, Rupa and Sanatana built beautiful, beautiful garden that was a replica of Vrindavana. They called it Kadamba-Kanana. There they excavated the places of Lord Krishna’s lila. They created a Radha-kunda and Shyama-kunda. They built a beautiful temple and installed the deity of Madan-Mohan. And so many of the pastime places of Lord Krishna they also developed. In fact, they would get out of their government offices as soon as possible every day and just roam through the gardens of Vrindavana in Ramakeli, completely absorbed in remembrance of Sri Sri Radha and Krishna. Rupa and Sanatana, they built a beautiful assembly house, specifically for Hari-katha. 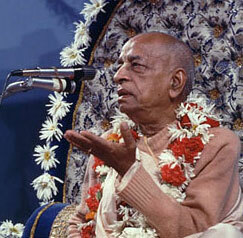 He invited Vaishnavas, devotees, scholars of the scriptures from all over the country to come. It is explained that hundreds and hundreds of these Vaishnavas and scholars would be gathered in this assembly house, and Rupa and Sanatana would be sitting there, effulgent. They looked just like Indra, in the courts of his pundits. They were so very eager to hear about Krishna from those who understood the subject thoroughly. And when they would speak, everyone was struck with wonder. They had become practically the world’s most proficient scholars of Sanskrit, Persian, and the local Bengali and Orion languages. They were the greatest authorities of the very scriptures of the world. Although they were multi, multi billionaires, they were so powerful that they were literally ruling the kingdom, and they were so learned, beautiful. Still, the amazing thing is, they were more humble than a piece of straw on the street. There they exhibited such an opulence of renunciation, although in such high positions. Any devotee guest that came, however insignificant and unknown, even poverty stricken, they would get down from their seats, bow down to those devotees, with folded hands, and honor them. They would personally serve each devotee prasadam with their own hands. With their money they built so many little houses on the bank of the Ganges. This was simply to take care very nicely all the guests that came. Their heart, their life, their soul, was to humbly serve the devotees. They became so famous, that if anybody wrote any literature in reference to the jnana philosophy, it would not be accepted unless Rupa and Sanatana gave their approval. In this way they lived, completely absorbed in hearing and chanting the glories of the Lord, while simultaneously ruling the state for the Nawab. 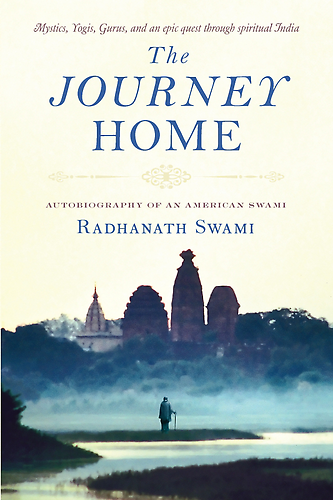 “Day and night they were just praying to Lord Chaitanya: ‘Please save us.’” – Radhanath Swami. The father of Rupa and Sanatana and Anupam, whose name was Kumara dev, he day and night was weeping in anxiety, because of the lamentable position of his sons. You know, most fathers, if they see their children living in magnificent palaces, multi, multi millionaires, with such power that they were ruling governments, parents would be quite proud. But Kumara dev was a Vaishnava. Therefore he considered that this was all nonsense. If they were not directly serving the Supreme Personality of Godhead, their life was being wasted. For years and years, his full time occupation was just performing yajnas, praying to Lord Krishna to liberate his sons from this horrible condition. One day Sanatana Goswami had a dream. He saw the beautiful, golden form of Sri Gauranga Mahaprabhu. In that dream he understood that he is the Supreme Personality of Godhead. Immediately, he told this dream to Sri Rupa Goswami, who was his younger brother. Sri Rupa and Sanatana and Anupam approached their mother. She said, “Yes, you should get out of this government service, somehow or other. Only Lord Chaitanya can save you. 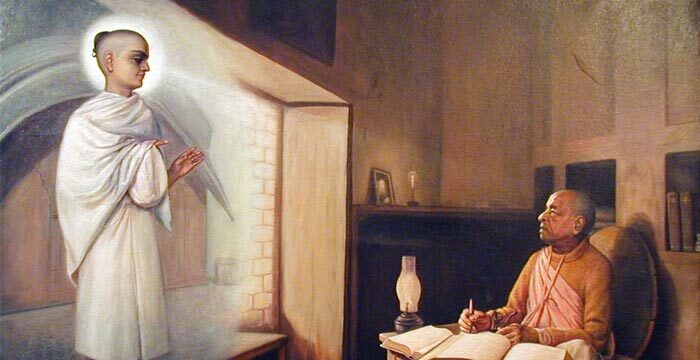 Why don’t you write a letter to him?” So they wrote a letter to Lord Chaitanya and delivered it. They explained their whole situation, and their deep desire to get out of this Nawab Husain Shah’s clutches and render direct, loving service to the Lord himself. They waited a long time, but there was no reply. They sent another letter. No reply. They sent another letter. No reply. Finally, after many attempts, they received a reply, which was only one line. Sri Gauranga Mahaprabhu wrote to them that: “Just as a young lady who is married, if she falls in love with another man than her husband, then she will perform her duties to her husband exceptionally attentive, so that he will not in any way suspect what is in her mind. But in her mind, she will be constantly absorbed in meditating on her paramour.” That’s all he said. So Rupa and Sanatana and Anupam knew exactly what to do. They had to carry on their service and just meditate on Krishna. Day and night they were just praying to Lord Chaitanya: “Please save us.” The Lord is in the heart of all living beings. And he always hears the prayers of his devotees.